When you're looking at a troubled industry, it's best to stick with the best. Some Nucor team members going to work. Image source: Nucor. The steel industry has been hard hit by an oversupply of the metal. That's left industry giants like ArcelorMittal SA (NYSE:MT) reeling and sent the shares of iconic companies like United States Steel (NYSE:X) into a tailspin. Some recent strength in the industry has lifted the prospects, and the share prices, of these companies. But I still wouldn't buy these dividend payers. Nucor (NYSE:NUE) is a much better option. ArcelorMittal is one of the world's largest steel makers. It's vertically integrated, means means it's also a large mining operator as well. In other words, when commodity markets started to sink in 2011, the company felt the heat on two fronts. On the steel side, Arcelor has significant exposure to blast furnaces. This is an older and more expensive method of making steel, leaving its costs high relative to competitors with a focus on more modern electric arc furnaces. The company has bled red ink for four consecutive years. Sure, it yields around 3.2%, but there's still a lot of risk with the dividend despite what appears to be a strengthening steel market. United States Steel, meanwhile, is an industry icon, but falling steel prices put a great deal of pressure on the company's business model, which is heavy on blast furnaces. Add a hefty slug of debt to that picture (long-term debt made up a touch over 60% of the capital structure at the end of the first quarter), and you can see why investors sold first and asked questions later when steel prices hit the skids. The company has lost money in six of the last seven years. U.S. Steel's yield is just 1.4% after cutting its dividend at the tail end of the 2007 to 2009 recession, and with so much debt, it's not out of the woods yet, either. Steel, the old way. Image source: ArcelorMittal. There are a number of big-picture issues with both ArcelorMittal and U.S. Steel, ranging from company specifics like generally expensive operations to industrywide problems like oversupply. To be fair, both are doing the right things to adjust, including closing mills, cutting costs, and dealing with debt. But, in the end, neither is operating from a position of strength, which is why these are two dividend stocks to avoid. That's true despite the recent price advances so far this year. However, not all steel stocks need sunny days to do well. For example, Nucor has been in the black in nine of the last 10 years. The last time it posted a loss was at the tail end of the deep 2007 to 2009 recession. And it has increased its dividend each year for over 40 years. Both are a testament to the company's strength. The current yield is around 3.1%. But what is this strength built on? For starters, Nucor has a heavy focus on electric arc furnaces. These mills tend to be less expensive to run and are more flexible production wise, so it's easier to, keeping it simple, turn them on and off. That allows Nucor to adjust to market conditions more quickly. Nucor, however, also has flexibility built in with its employees, too. That's because its pay system is designed to reward employees during the good years, but it asks them to share some of the pain during the lean times. So, its salary expense goes down exactly when it's most beneficial. Many of its competitors have much more restrictive labor agreements in place. Nucor is also pretty conservative in terms of debt. For example, at the end of the first quarter, Nucor's long-term debt was just under 40% of the capital structure. In fact, with its strong balance sheet, the company has a history of investing during downturns so it comes out the other side a stronger company. It's been doing the same thing this time around, with ground-up construction and targeted acquisitions. In other words, while companies like ArcelorMittal and United States Steel have been retrenching, and their shareholders have been suffering through long periods filled with red ink, Nucor has been showing off its inherent strengths. Sure, when the steel market finally starts a sustained rebound, U.S. Steel and Arcelor will benefit -- likely more than Nucor. 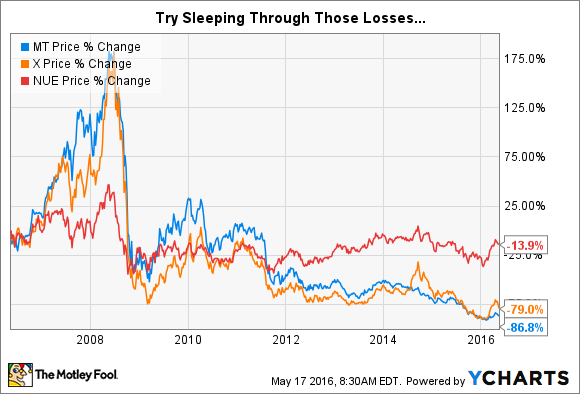 But Nucor is a stronger business that won't cause you sleepless nights. Add in a dividend yield that's competitive with Arcelor and much higher than U.S. Steel's, and the story is all the more compelling. And that's why Arcelor and U.S. Steel are two dividend-paying companies to avoid, and Nucor is one worth buying.